Coconut Potato Fudge has a strong coconut flavor, a dark chocolate topping, and a creaminess that comes from...mashed potatoes?! This fudge recipe is a great way to use up leftover mashed potatoes, as long as they aren't seasoned with savory ingredients. Line an 8x8 inch baking pan with foil and spray the foil with nonstick cooking spray. Mix mashed potatoes and butter in a large mixing bowl. Gradually add the sifted powdered sugar in batches, beating until well combined. Stir in the coconut, vanilla and salt. Press firmly and evenly into the baking pan. Melt the chocolate and the vegetable oil together in the microwave or over a double boiler. Spread the melted chocolate over the top of the fudge, and chill until the chocolate is firm. Cut into one-inch squares to serve. 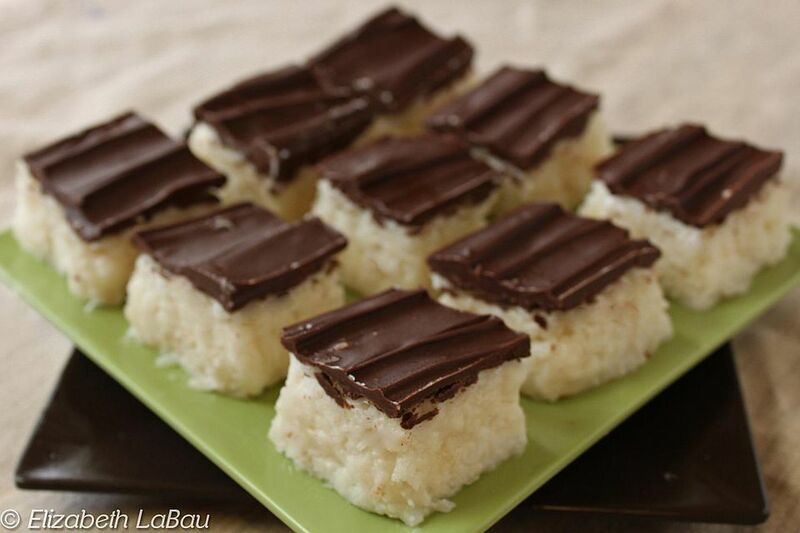 Store Coconut Potato Fudge in an airtight container in the refrigerator for up to a week.